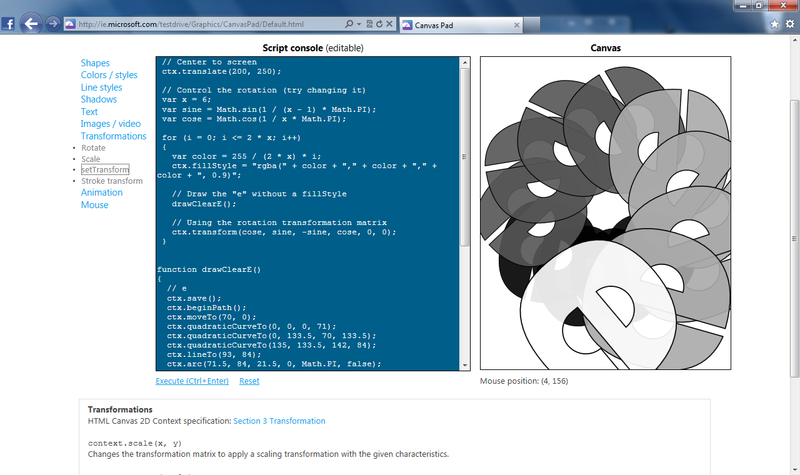 If you are new to HTML5 Canvas, I recommend you try out a tool I created on the IE Test Drive site called Canvas Pad. If you’ve seen the Test Drive demos for hardware accelerated Canvas graphics, you are probably excited by the potential of this technology and want to learn more about it. With all major browsers supporting HTML5 Canvas, a scriptable 2D drawing context, Canvas is quickly becoming the natural choice for graphics on the web. Even though the Canvas API, as defined in the HTML5 2D Context spec, has less than a hundred methods, attributes and interfaces, sometimes it’s easier to learn a technology by looking at sample code and simple demos. Canvas Pad attempts to fulfill these needs. As the Internet Explorer Program Manager for Canvas, I find myself answering a lot of questions on how to do things in Canvas – I have seen great results by just pointing people to this tool. As you can see from the image below, this site contains both a view of the actual Canvas and a script console containing the code generating the Canvas context. You can update the code and make real-time updates to the Canvas. The Canvas Pad demo shows both the Canvas and sample code that you can manipulate. Canvas Pad contains 22 samples on shapes, color/styles, line styles, shadows, text, images/videos, transformations, animations and mouse movement, which you can click through on the left hand pane. Further, below each sample, there is a reference to the API signature and the 2D Context spec definition of the API you are looking at. I have found quite a few of my friends finding this tool useful to learn Canvas. If I want to tinker with a new idea, sometimes I just open this up and drop some quick code. Try it out yourself! Posted on September 4, 2011 September 4, 2011 by jatindersmann	This entry was tagged 2D Context, beginniner, Canvas, HTML5, learning tool, samples, W3C. Bookmark the permalink.